Lhawang Drakpa was born in Tö, Western Tibet. At first he received training in the Upper Drukpa Kagyü tradition as well as in the Oral Tradition of Rechungpa. He also received the teachings of the Nyingma school. 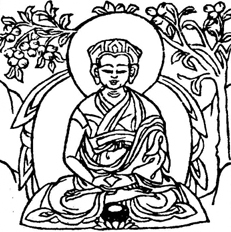 Later, after he had met with Jetsün Künga Drölchok and attended upon him, he received the transmissions and teachings of the Jonang and Sakya schools. All of these teachings he received in their entirety, with nothing whatsoever left out. Most importantly however, he received from Künga Drölchok the complete transmission of the teachings and practices of the Shangpa Kagyu, which were closest to his heart. Putting these teachings into practice, he truly erected the victory banner of accomplishment. Experiences and realisations were overflowing from within, and he fully mastered the practices of channels and subtle energies. He attained the deathless vajra-body and lived for more than 120 years. Where the Sakya, Kagyü, Jonang and Shangpa traditions are concerned, he had many students who came to study and practice these under him. In particular, he passed on the Shangpa tradition in its entirety into the hands of its owner, the All-knowing Jetsün Jonang Tāranātha, and invested him with the responsibility of its continuation. Shortly after this, he passed away into other realms. The majority of his precious remains were enshrined in a golden reliquary in Draktö called Tashi Öbar. For as long as it remains as a support for the offerings of beings, it will be a cause for their rebirth in the pure realms. Chöku Lhawang Drakpa later manifested as one of the masters of Droggé monastery (jo nang ‘brog dge dgon nges don bsam ‘grub gling), which is to the present day one of the largest and most important Jonang monasteries in Amdo. Adapted from: dpal ldan shangs pa’i chos skor gyi ‘byung khungs yid kyi mun sel by Jonang Tāranātha, vol. 34, p. 194-285 of his Collected Works, dpal brtsegs bod yig dpe rnying zhib ‘jug khang edition (translation from Tibetan by Lama Shérab Drimé).